Diana Mackie is a renowned Scottish Contemporary Landscape Artist based on the Isle of Skye. From her studio in Borreraig near Dunvegan, Diana creates original works of art that are also available as Canvas prints, Giclee prints, puzzles and curios. Diana approached Skyewebsites to replace her existing site to create a secure website with ecommerce facilities that would truly reflect the quality and style of her work. 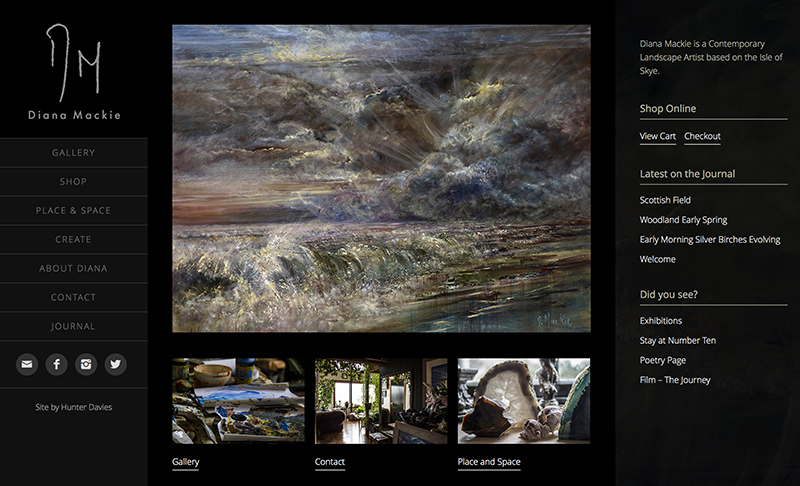 Skyewebsites started with a contemporary re-fresh of the logo and then designed the website to include a gallery for original paintings, sections that help communicate the place and space that Diana works in, a history archive, a journal to keep followers up-to-date and a secure online store. The project included web design, branding and photography. The website runs on WordPress and ecommerce is provided by WooCommerce.